The UTX POST is a lightweight long leg brace (also called KAFO, orthosis, or splint). It is an edition of the UTX, specially developed to suppress the great forces around the knee due to severe hyperextension. The UTX POST pelottes at the lower leg are mounted at the back (posterior – hence the name POST). As a result, this variant is perfectly capable of correcting the knee that wants to move backwards. 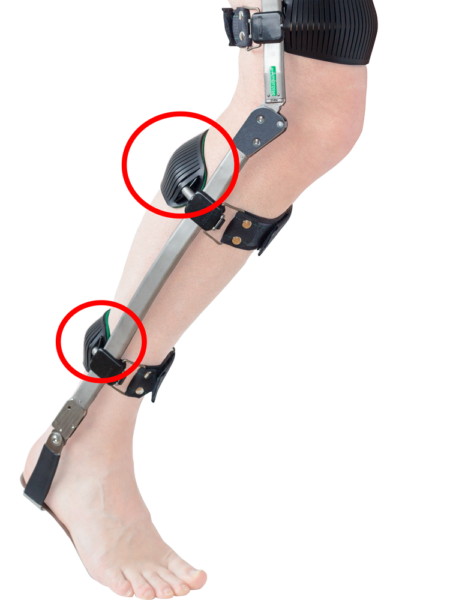 The UTX support surfaces (pelottes) of the UTX are placed as close as possible to the knee (without interfering) to maximize control over the knee. The UTX POST can be combined with all versions of the UTX. However, donning and doffing (depending on the chosen support around the ankle and foot) may be a little more difficult. Therefore, this variant is chosen only if the overstretching of the knee gives rise to this. Individually adjusted and therefore great fitting. The UTX POST is intended for people who have a severe overstrechting (hyperextension) of the knee. See also the other UTX versions, such as the UTX SWING, UTX STABIL of UTX ESC for more information about UTX’s application capabilities in your situation. In this video you can see how the orthosis is put on. For more videos about using the UTX, you can visit our YouTube channel. How does the UTX POST work? The UTX POST can be combined with all variants of the UTX. For more details on how, for example, the knee hinge works in an UTX SWING, visit the product details page. What the UTX POST distinguishes is the rearward position of the lower leg pelottes supports. This allows a direct and stable control of the backward force on the knee in case of hyperextension. Especially if the UTX POST is combined with an UTX FREE (no blockage to flexion, but an extension stop in the knee hinge), it is very important to properly adjust the orthosis. If the postion to hold back the knee, is put too much in extension, we will not do enough. That is annoying for the knee, but also leads to much greater power on the UTX (especially on the pelotte just under the knee). This can soon lead to an uncomfortable situation. However, if we put the position too far in flexion, we may put the knee too far ahead. Stabilizing the knee then takes more power from the quadriceps and thus more energy while walking. If the quadriceps also have a reduced function, a dangerous situation can soon arise. In such a case, the UTX SWING POST (the UTX SWING in POST version) may be a better solution. Do you want advice on what is the best solution for you? Contact us and ask our clinical experts for advice. If you want an overview of all different UTX types, please visit this page. Active and dynamic correction of the leg. No limitation of the normal gait.